We’re purchasing the first wildlife crossing in the Okanogan Valley, but we need your help to secure funding for more crossings and fencing! More than 350 mule deer are hit by cars each year in one short section of Highway 97 in north-central Washington. We’re working to stop this needless loss of life, including advocating for public funding for additional crossings. Join us in TAKING ACTION! You can also learn about partner efforts at safepassage97.org. March 2019: Fundraising goal met for first Highway 97 wildlife crossing! Running alongside the Okanogan River and cutting between the North Cascades to the west and the Okanogan Highlands and Kettle River Mountain Range to the east, Highway 97 is a busy transportation corridor that tears through the migration route of Washington’s largest herd of mule deer, and divides critical habitat for Canada lynx and other species. This stretch of highway has among the state’s highest rate of auto/deer collisions, presenting a huge safety hazard. In fact, more than 350 deer are needlessly killed along just a 12-mile stretch of this highway every year. That’s nearly one deer killed per day…and even that’s a conservative estimate. These accidents not only cost lives, they also cost a lot of money. Animal-vehicle crashes along Highway 97 alone costs drivers, insurers and tax payers more than $2,275,000 annually, with an average cost of $6,500 per accident, including vehicle damage, Washington State Patrol and emergency medical response, value of the deer, as well as clean up by the Washington State Department of Transportation (WSDOT). Through the generosity of more than 570 of our donors and the support of our partners at the Mule Deer Foundation and the National Fish and Wildlife Foundation, together we’ve raised more than $200,000 to purchase the first wildlife undercrossing on Highway 97 where it passes the Carter Mountain Wildlife Area. Our efforts are now focused on securing state funding for two additional crossings and fencing to keep both wildlife and motorists safe. Learn more on this page. The reality is highways connect people, but divide habitats. Fortunately, wildlife crossings allow animals to cross busy roadways without harm. Deer and elk are often the first to use wildlife crossings, but even the most hesitant of animals, like bears and even lynx, routinely use them. Since 1989, Conservation Northwest has worked to connect our region’s most critical habitats by improving the corridors between them so wildlife can migrate and maintain healthy populations and genetic diversity, even in the face of human development and a changing climate. And just look at Interstate 90, which formerly created a bottleneck between Washington’s North and South Cascades. Conservation Northwest spearheaded two successful campaigns—The Cascades Conservation Partnership and the I-90 Wildlife Bridges Coalition—to restore habitat connectivity for the species that call the Cascades home. Wildlife are already using these newly-built crossings to safely get from one side of the busy six-lane highway to the other. Now, we’re turning our attention to the bottleneck created by development in the Okanogan River Valley, including Highway 97 in central Okanogan County. The highway cuts through the path of Washington’s largest herd of mule deer and divides precious habitat for Canada lynx. We aim to secure safe passage for these important species and support habitat connectivity through the implementation of a wildlife crossing under Highway 97, near the Carter Mountain Wildlife Area. We’re working with partners to improve the Cascades to Rockies habitat corridor where it crosses the Okanogan Valley through a collaborative effort called the Working for Wildlife Initiative, facilitated by the National Fish and Wildlife Foundation (NFWF) and coordinated by Conservation Northwest. A key objective of the Initiative is to create safer passage for people and wildlife on Highway 97 in Okanogan County, near Riverside. In collaboration with the Washington Department of Transportation (WSDOT), we have identified a 12.5-mile stretch of this highway where a wildlife underpass is most desperately needed. The underpass will cost approximately $200,000 to build. Luckily, we are sharing this cost with two key partners, the Mule Deer Foundation and the National Fish and Wildlife Foundation. 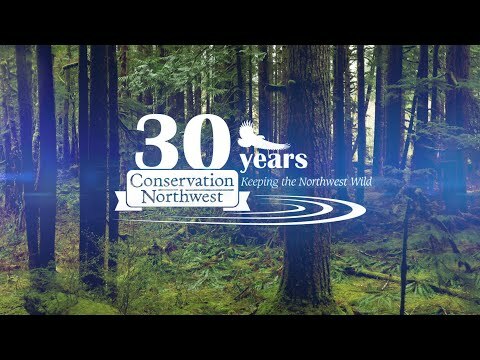 In 2018, Conservation Northwest undertook a campaign to raise our share of the cost—$125,000. We met our goal in early 2019! What’s more, the installation of this first underpass will make a great case to the Washington State Legislature to fund additional Highway 97 wildlife crossings project needs in its 2019 Transportation Budget Bill. This is a rare opportunity to be a part of a tangible solution for safer passage for people and wildlife in north-central Washington. We hope you’ll join us to restore connectivity between the North Cascades and the Columbia Highlands. We owe it to the Mule Deer and Canada lynx whose habitats we’ve divided with a highway. This is our chance to restore their right-of-way. Learn more about the need for crossings in this WSDOT report or on the SafePassage97.org website. You can take action for more crossings HERE.